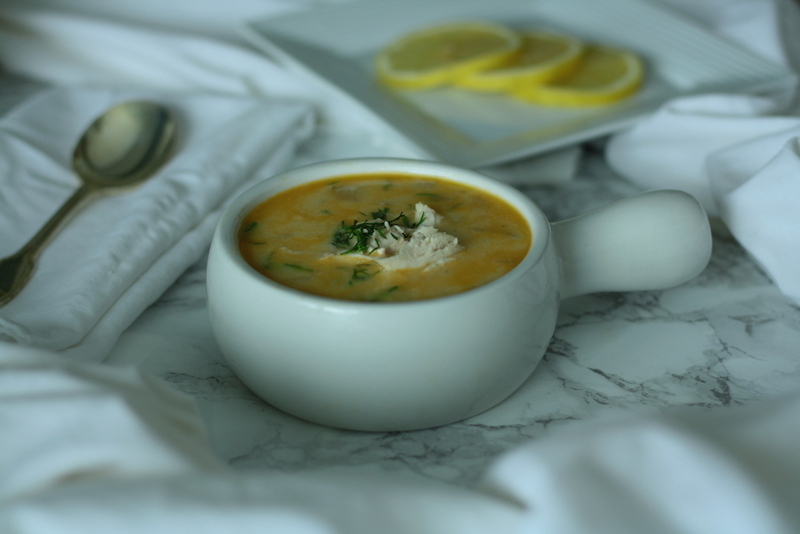 Greek Lemon Soup (Vegetarian + Chicken) | ya, we're basic. The weekend is here and I’m back in the city and colder than ever. Seriously, my knees are in pain because they’re not used to the cold! So instead of complaining about it, I am choosing to embrace it with a little love from the kitchen. I made this Greek Lemon Soup before I went to LA and it was a hit on my Stories. Why such a hit?! Well it was pretty delicious and looks gourmet but it also can be made as a vegetarian version or with meat. I love having the two options because with my mummy in the house (she is vegetarian) I like making things that she can quickly grab and go for in the fridge as well. It is a bit of a trickier recipe than I normally make (poaching chicken and tempering the egg in the broth can be tough) but it’s worth the attempt and no matter what happens to the eggs it still ends up tasting delicious, so DON’T WORRY ABOUT IT! Sauté over medium-high heat until onions are translucent and softened. Add garlic and sauté 1 minutes. Add veggie (chicken) broth, bay leaf, salt, pepper. Bring to boil over medium-high heat, cover and turn heat down to medium-low. If using veggie broth and want to add meat, poach chicken separately while broth is simmering (see below). Mix in 1/2 a bouillon cube until dissolved. Reduce to medium heat, add chicken and cover. Poach for 15-20 minutes while broth simmers. Remove chicken from water, let cool and shred. Add shredded chicken to your individual bowl as desired. Enjoy kiddos and let me know if you try out this recipe and how you faired, x.